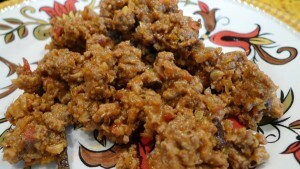 Daas Qeema recipe by Mrs Sami at DesiRecipes.com. Green Onions 1 cup (finely chopped). Fresh Hara Dhanya 1/2 cup (chopped). Green Chillies 6 (finely chopped). Lal Mirch Powder 1/2 tea spoon. Tomatoes 3 (chopped in squares). In a vok heat oil. Add qeema,onions,green onions,salt ,lal mirch powder,haldi ,green chillies & fresh hara dhanya. Let cook on low heat till the qeema is half done. Then add tomatoes,fry for a while then put on dum. Garnish with chopped hara dhanya and serve hot with roti.